Technology is a cornerstone of our business and is supported by technology centres in each region, covering every section of the value chain. Optimising our equipment and forestry assets. Sappi Research, Planning and Nurseries: • Tree breeding • Tree biotechnology • Seed technology • Propagation techniques • Silviculture. Our decision to build a pilot nanocellulose plant aligns with our strategic move into adjacent markets. Nanocellulose is drawing worldwide attention as a lightweight 'super material' with exceptional strength properties. The scale is so minute that 200,000 nanofibres can easily fit into a single strand of human hair; yet an addition of just 10% of nanocellulose into the mix of a composite material, can increase the overall substance strength by over 70% (according to the University of Maine's Advanced Wood Engineering Composites Center). Sappi's pilot-scale plant for low-cost cellulose nanofibrils (CNF) production at the Brightlands Chemelot Campus in The Netherlands, will soon come on line. This facility offers state of the art R&D and manufacturing infrastructures, on campus education and science oriented business support, venture capital, and business development services. On another 'new business' level, we are exploring various energy opportunities through the use of biomass as a fuel source to counter the use of fast depleting fossil fuels and the related issue of CO₂ emissions. In our case, biomass is the waste products from our manufacturing processes, such as woodchips and byproducts derived from wood. Globally, over 52% of the energy generated by our operations is derived from renewable sources. We are now investigating more ways to extract value from biostreams to generate energy. We promote an internal culture of innovation through the annual Technical Innovation Awards. 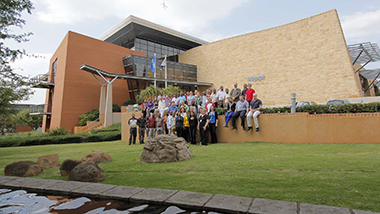 Discover everything you need to know about our flagship Sappi Technology Centre in Pretoria – a source of innovation for over 50 years. We believe the key to profitable, sustainable development is customer focused innovation. Sappi’s Research, Planning and Nurseries department enables the cost effective and sustainable supply of suitable forest resources to the business.